Thanks to TWILIGHT and TRUE BLOOD, we are on a vampire cycle in media right now. But just a few short years ago, we had a re-introduction of zombie (and zombie-like) films. 28 DAYS LATER, the DAWN OF THE DEAD remake, another couple Romero films. 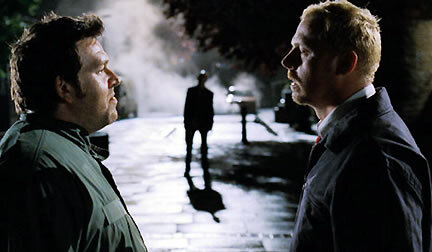 There, to skewer them all, was the little British film SHAUN OF THE DEAD. I watched SHAUN OF THE DEAD (2004) at movie night on 9.17.09. It was my first viewing of the film. The first act of this thing is filled with none-too-subtle references to normal humans as zombies. Some of them are creative (the people on the bus) some of them are not (when Shaun wakes up). More subtle was a single line on a newsfeed which mentions that a meteor has crashed into south London. A nice touch, with the zombies origin never explained otherwise. ~ by johnlink00 on September 18, 2009.